Magnus Carlsen has powered himself to a 1.5-point lead at the World Rapid Chess Championship on the second day of play in Astana, Kazakhstan. He is leading with 8.5/10. Five games had been played on Day. Karjakin and Carlsen were in joint lead at the beginning of second day's play. By the end of the day, Karjakin had lost two games against Mamedyarov and Carlsen. Carlsen, earlier in the day, drew with Gelfand and Dreev, but beat Mamedyarov and Tkachiev as well. 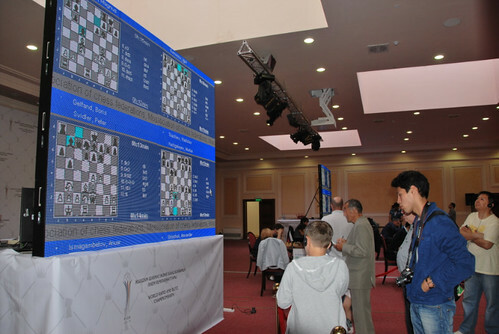 Five more rounds are to be played on Sunday to decide the World Rapid Chess Champion 2012. Karjakin and Topalov are in second place with 7.0/8. Karjakin started with a draw and two wins, but lost his final two games against Mamedyarov and Carlsen. The game Carlsen-Karjakin is now up at Chess King.